One of the great rites of passage as a new mum is the first day you get to venture out alone without kids. My cousin’s little boy is just on 10 months and at about 6 months we decided a day out without baby was in order. The real dilemma was of course, where should we go? Shopping, pampering, movie-ing? What did we want to do now that we were somewhat out of the baby fog? When we saw tickets being advertised for the Good Food and Wine show, we knew we’d found the answer. We are both food-mad and watch the Lifestyle Food channel religiously. The prospect of seeing some of our culinary heroes in the flesh was too tempting to resist, and the call of food and wine was strong. We planned our day around the demonstrations, keen to see Matt Moran and Gary Mehigan cooking live. We also lamented the absence of Paul West, the host of River Cottage Australia and one of our all time favourites. We didn’t have much time to dwell as we walked in and straight into a live cooking presentation by Matt. He wowed us with cheffy magic and regaled us with tales of Maggie Beer. He also cooked a slow cooked lamb shoulder and as our mouths watered, I declared that that would be the first dish I cooked in my newly purchased slow cooker. As the day drew to a close, our hearts and bellies full and our heads a little foggy from perhaps a little too much wine tasting and stingy use of the spittoon, we walked right passed a booth with no food and a few people. My eye was drawn to a man in a blue shirt and signature beard. A double take and and a third glance to reconfirm told me I was in fact seeing Paul West. No cooking, no Digger, but the man himself. My cousin and I quickly ran into the booth, paid the exorbitant fee of two dollars (the money was going to a great cause) in order to secure a selfie with the man himself. Day, week, month made! I did in fact return home and put my Matt Moran inspired lamb cooking tips to use and turn the poor lamb shoulder, long relegated to the freezer, into a melt in your mouth thing of beauty. But, being as we are only a family of four, a two kilogram piece of lamb generates plenty leftovers. In the spirit of Save with Jamie I always portion the leftover meet and freezer. 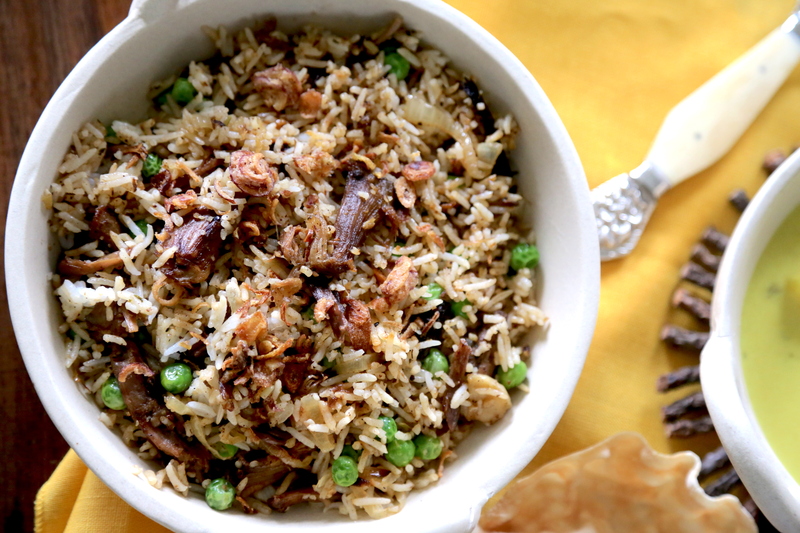 Roast pork often gets turned in protein for noodle salads and chicken will adorn fried rice. Lamb though, gets the biriyani treatment. This has become a family favourite, something loved by adults and kids alike. In a large wok or frying pan add the ghee, ginger garlic paste, onions, cloves and cardamom. Fly until the onions are picking up some colour and the ghee is well perfumed. Add the green chillies, tomato, coriander and garam masala. Cook for a couple of minutes until the spices and onions are well combined and starting to soften. Add the cooked lamb and salt and pepper to taste. Add the cooked rice and stir thought until everything is well distributed. Add the peas and cover for a few minutes until they are cooked through. Looks delicious ! Nice presentation ! Thank you! You do eat with your eyes after all?